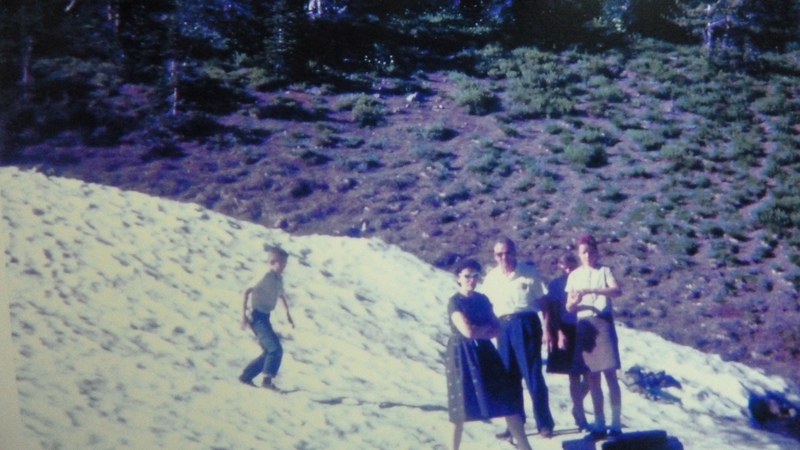 Before a blast of winter buries all our memories of summer—yours and mine—I want to share and contrast the trip my growing up family took out west the summer of 1964, with my husband’s and my trip this summer (accompanied by his brother, well-documented ad nauseum here). I share this now because any time is a great time to begin to plan a “big trip.” Maybe even make an announcement as a Christmas surprise for the family. My three siblings and I all recall how Daddy first started dreaming of taking us out west. It was about 1959. 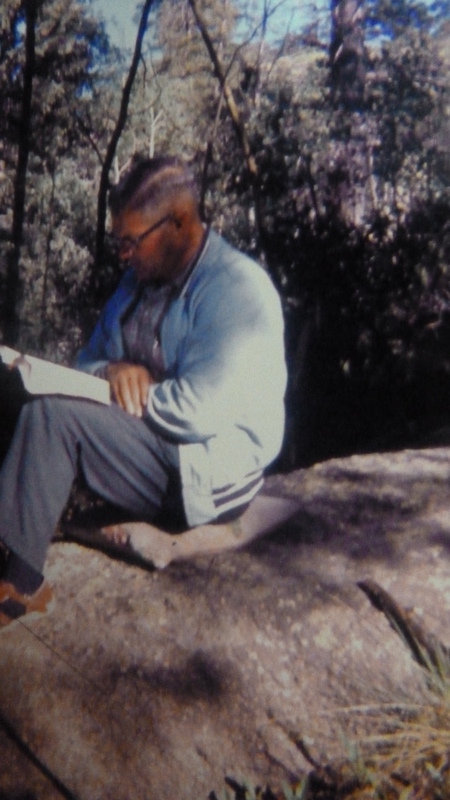 He said we would take six weeks and he wanted us to visit many of the national parks, especially Glacier National Park, where he worked as a conscientious objector during World War II. We would camp and also stay with friends and family we knew out west, including some of his old “service” buddies. And Dad being dad, we would visit Mennonite mission work and churches. No vacation from church when this family traveled, no sir-ee Bob. We informally called it “Mennoniting your way” before there was ever an organized method of doing this. 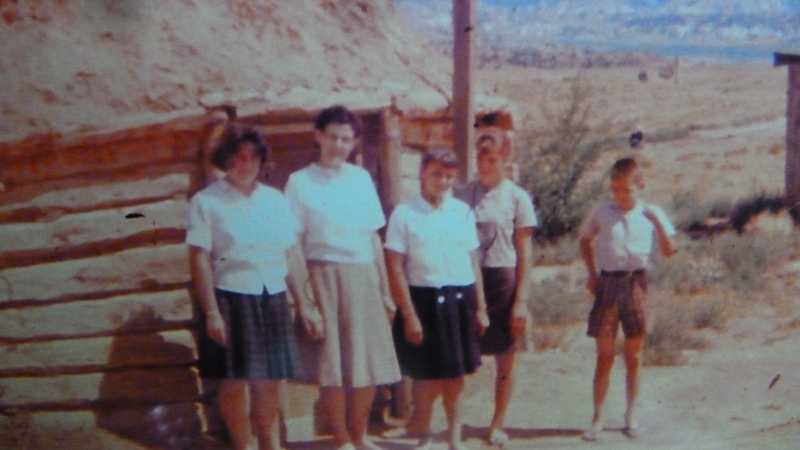 Our family visiting the Navajo reservation, 1964 where there was the Black Mountain Mennonite Church. We wore skirts that day. But us kids couldn’t fathom five years into the future. It was too long to wait! We would be “too old.” We wouldn’t have any fun. We wanted to go sooner. But Dad and Mom talked each of us into start saving a part of our allowance or egg gathering money so that we would have our own money to spend on the trip. That helped give us buy in, I recognize now, and also helped us understand how a longer period of time to save would give us more money to spend—and more fun for us. We were an ordinary farm family of modest means and this trip was big. One of the things I loved about Dad was him getting out the atlas on a blustery Indiana winter night and mapping out routes: “What do you think of taking the southern route first across the country, hit Oklahoma, see our friends the Troyers, head up to Colorado and stay at Rocky Mountain Mennonite Camp a few days, see Pike’s Peak, head down through Mesa Verde National Park. 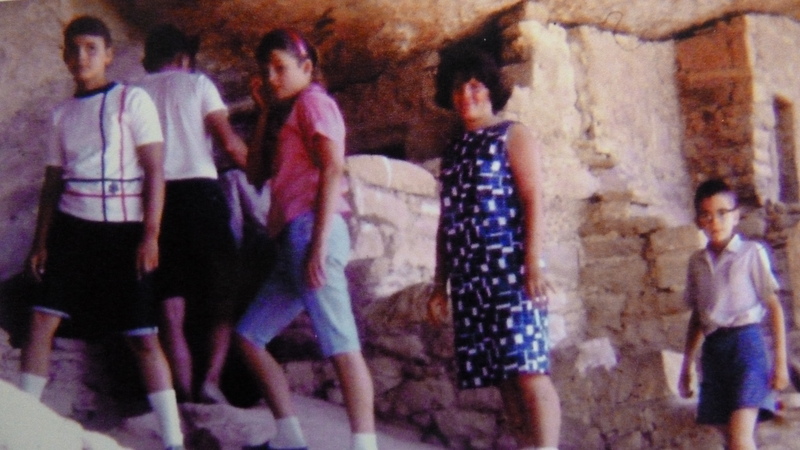 My siblings and I exploring Mesa Verde: left, Pert, me, Nancy, brother Terry. We were thrilled to be allowed to wear “shorts” on this trip. Dad promised we would see Grand Canyon, then cross the desert at night to Bakersfield, California, go down to Los Angles and visit Knotts Berry Farm that Grandpa and Grandma Miller got such a big kick out of (as 80 year olds, my grandparents flew to California to visit a granddaughter’s family for the trip of their lifetime, especially since Grandpa had traveled in a covered wagon as a 3 month old baby, but that’s another story). And so on. Dad enjoying his morning Bible reading (note pillow) at Rocky Mountain Mennonite Camp. Can we go to Disneyland? we asked. Can we see movie stars? The first real modern day theme park opened in Anaheim, Calif. in 1955. By the time of our trip, 1964, we had only owned a television one year, but we already knew about Disney and the magic of Hollywood. Dad allowed that yes, maybe we could go to Disneyland. If we saved our pennies. I think the admission charge was something like $5 each. Disneyland!!! We could hardly believe our luck. We were farm kids. We would be the talk of our friends. We would be like movie stars ourselves. Maybe Disneyland was worth waiting five years. At about one year out, I took it upon myself to begin writing to the National Parks on our list and each city that Dad and Mom had mapped out that we’d hit, to get information on campgrounds, fees, and local attractions. I don’t have to remind you there was no Internet to help with all that. But it was almost as time consuming an exercise for me to do all that via Internet this past spring as I planned and plotted with my husband and brother-in-law for our 2013 expedition: find motels, make reservations, find the best bargain in plane tickets and a car rental that wouldn’t be cost prohibitive as a one way rental (we planned to pick up our car in Phoenix and return it in San Francisco). In 1964, my sister Nancy was the photographer for our trip and she mostly took slides so what follows are a few photos that she transferred to prints. We also made a big mistake and left her camera in the back window of a hot car one day, not only ruining the camera, but a complete roll of pictures. Eventually she got a new camera on the trip. 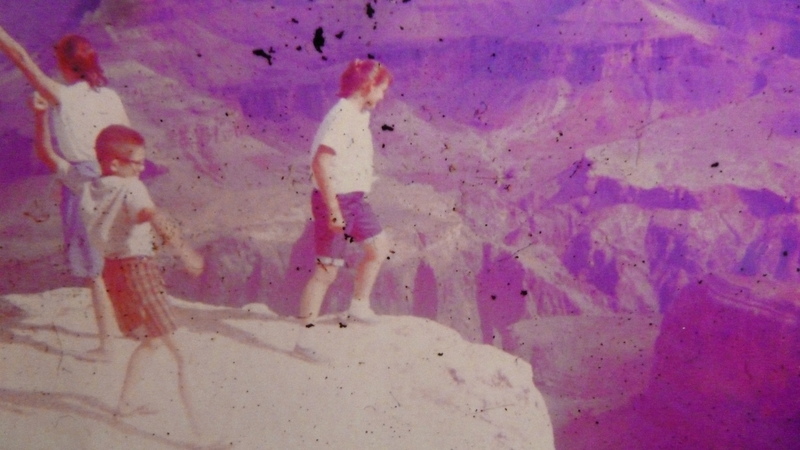 Top: One of the photos ruined in the camera meltdown: throwing rocks into Grand Canyon. I’m on far left. 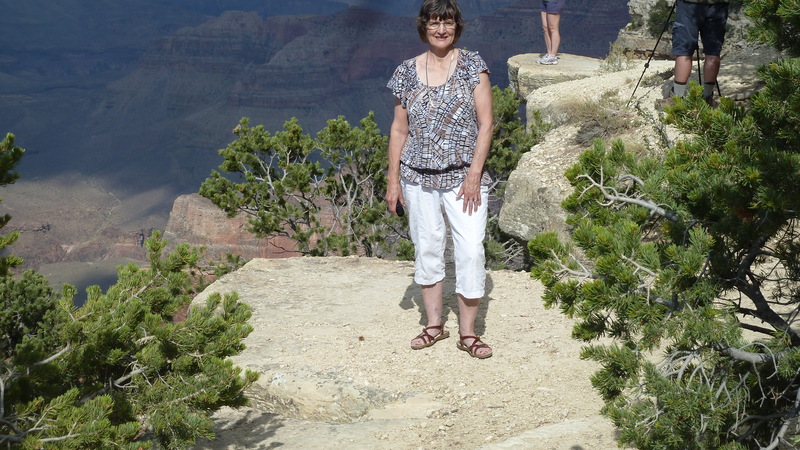 Bottom me at overlook at GrandCanyon, 2013. And back to the budget? When we got home Dad figured we had indeed averaged spending $20 a day including a $2 a day rental fee for our camper (which barely slept 5, my brother soon decided he would do better in the back seat of the car or our pup tent), gas, food (many times just a can of soup or a package of hotdogs heated up for lunch in the camper at a roadside stop), and attractions. Once a week we got to stay in a motel (only later did I really figure out why Mom and Dad needed a motel once a week, with their own room) and maybe once or twice a week had a fast food or restaurant meal, and plenty of nights camping on the lawn of friends. Snow, somewhere in the Rockies. And no, we were not too old to enjoy the trip! Even at that time, we probably loved the variety of nature sites we visited (Yosemite, Sequoia, Redwood, Mt. Hood, Mt. Rainer, Crater Lake, Yellowstone, and Mt. Rushmore) even more than Disneyland. As kids, we especially liked having our own money, which we had dutifully saved, to spend as we liked—carefully budgeting so we’d have enough for the whole trip (not blowing it the first day or two). 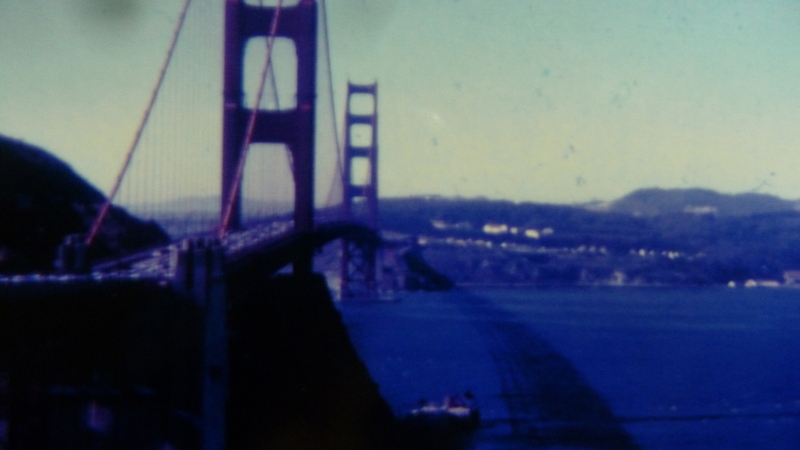 Top: Golden Gate Bridge 1964. 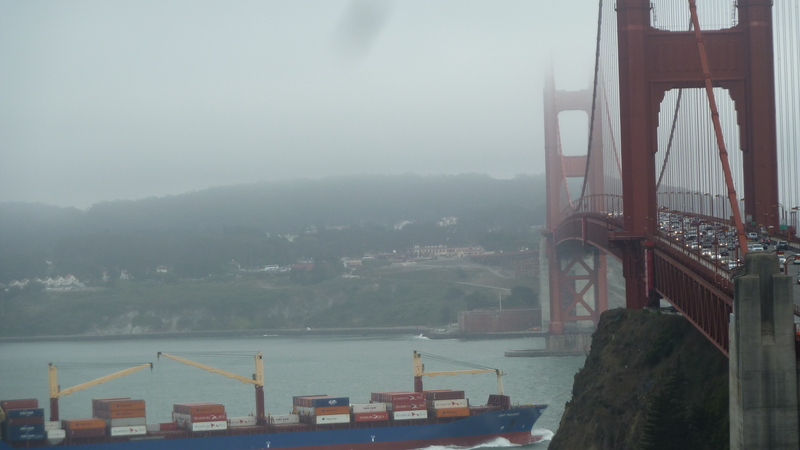 Bottom: Golden Gate, 2013. And no, it was not all harmonious. By the end of the trip, we were all homesick and anxious to “head for home” as Daddy put it, hurrying through the last states so anxious to see our friends, pets and home. Is that why we go on great trips—to make us enjoy home even more? 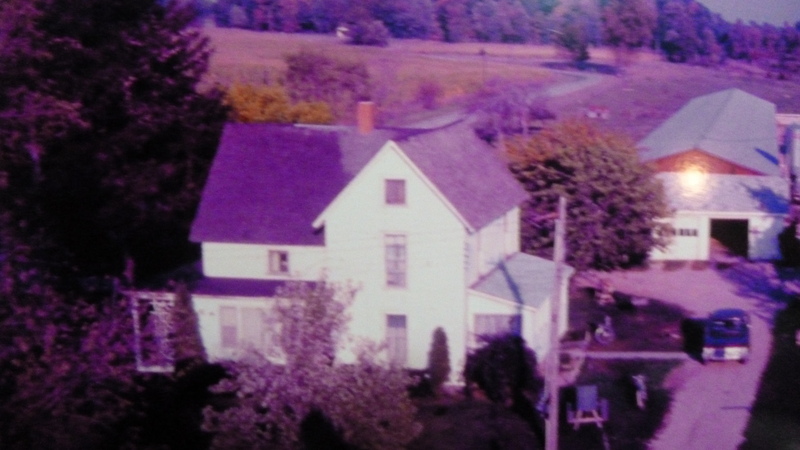 Home sweet home in Indiana, our farm near Middlebury, circa 1967. For my parents, traveling together as a family was as much a part of our faith walk and training as going to church. I will be forever grateful. I sure enjoyed reading about your family trip. I’m glad you could enjoy reading about someone else’s memory. Usually stories evoke other memories, right? Hope so for you. We went on a big family trip in 1967, the summer before I turned 14, and the year Montreal hosted the summer Olympics. While the world was heading for Canada, we were heading away from Toronto, to trek our way, kitty-corner, to California. Dad, Mum and we three girls, all packed into the car, windows down, singing and laughing about the experiences to come. We didn’t camp, as we had been cottagers, and didn’t even own a tent or sleeping bag. We stayed in motels, and while in California, stayed with family. We saw the most beautiful landscapes, picnicked our lunches and dinners, had breakfasts in restaurants (I was goggle-eyed at getting to have pancakes with blueberry syrup). I loved the desert, and we took time to get out of the car and do some exploring. I remember picking up a lizard, and being stunned when it bit me. It didn’t hurt, but I was so shocked that I flung it quite quickly away. We went to Disneyland and Yosemite, and I bought my first ever polished agates – 5 for 25 cents! From California, we travelled up the west coast to B.C., where we spent time with more family in Fernie. In Alberta, we learned all about Frank Slide, and the baby that survived it (named, appropriately, Frankie Slide). Then, we headed back home – it seemed like the longest drive ever. The prairies were absolutely desolate. I have no memory of Manitoba, but I do remember going through Marathon, Ontario, where it smelled like stinky feet. We pushed it the last leg of the trip to get home, even though it was getting late. I remember being afraid my father would fall asleep while driving, and I tried to stay awake to make sure that didn’t happen, but I eventually nodded off, and awoke as we pulled into our driveway. In all, it took 3 weeks – way too fast for a relaxing vacation, but we have wonderful memories of it, all the same. How very interesting–we covered some of the same territory, the same summer! I love the part about you wanting to keep your father awake but falling asleep anyway, then waking up as you pull in the driveway. We pushed it very hard the last day too, probably covered 500 miles at least. So you went from Toronto to California?? Wow indeed. We always spent our summers at the family cottage and continued to do it when our own family came along. Left home at the end of June and returned in time for school on Labour Day. My husband came up for weekends and his vacation time. Caro-Claire–to spend a summer, literally two months, at a cottage, Wow! That sounds very Canadian–I have a woman in my small group at church who goes north to Quebec every summer and does that with her family too. What a wonderful tradition. Both my parents and my husband’s parents had purchased summer cottages around the same time . ours about 1950 and my husbands family about 1952 . Ours was on a river and his was on a beautiful northern lake called Lake Kashagawigamog. My parents had it built from scratch and his parents bought a small place that they added on to over the years. As the years progressed and we married , our family grew to 5 children and my parents eventually added on to our place so that we had our own quarters. I think that made for a quieter vacation for them with us on our own! We would go for maybe a week to my husband’s family but it really was not a great set up for babies and little kids, even though Grandma and grandpa enjoyed our visit. That was where the family all learned to water ski and fish with grandpa. Farther along my parents eventually sold their place ( in the 80’s ) and my husband’s parents were running in to health problems. However by that time, his little brother (11 years younger) was married with small children and he and his wife took over the cottage. It was all done very amicable between the two boys and we have always been most welcome to spend time there if we wanted..
Now they too are empty nesters and both are retired so they now spend their summers there too and we usually visit a couple of times in the season. It is still a lovely place to be and the setting is beautifully quiet and relaxing. I would love to send you a picture of their place now but I don’t know if there is any way on here to do that? Our children have wonderful memories of their summers in Northern Ontario Canada. I have very fond memories of a family trip around the West, North then East coast of Scotland when I was a child. Dad, Mom, sister Pam 4 years older than I, Uncle David and Auntie Julie. Six of us in a car built for 5. (well before the days of compulsory seat belts) An A60 Austin Cambridge. This was with accommodation ‘on spec’ as they called it -on speculation- we never knew where we would be staying until we arrived in a village or town late afternoon/evening and made enquiries. We didn’t stay in hotels or guest houses but with local crofters who took in guests in the summer and provided B&B. Never heard of “on spec” but one of our motels (this summer, not 1967) turned out to be something we didn’t want to stay in once we saw it. The owner was very gracious, near Sequoia National Park, who said if we didn’t want the room, she had a waiting list from the park of people hunting for lodging. But I need to tell you my daughter spent a semester in Scotland and SO fell in love with the country. Is that where you are from? Love your story! Dad (Terry) looks so scrawny!!!! I cant believe how awesome that trip sounds but better then that is the fashionable skirts you chicks are sporting! Loved the story. Isn’t he awesome? (it was an awkward age). I do not have the picture, but mother made all of us matching shirts out of this brown print fabric and on days we all wore the same shirt, it was really awkward. Glad you found this! He was/is my best and favorite brother. We could talk for hours. « What can one person do about hunger?